The first two books of Durst’s Queens of Renthia series were so wonderful; I can’t wait to see how this one will wrap up the trilogy. 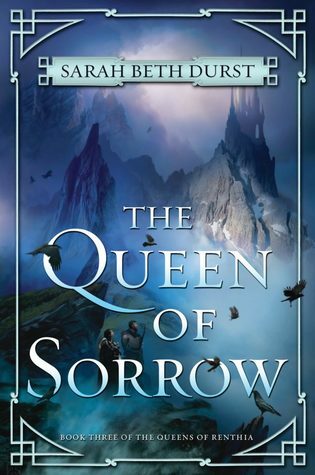 “The battle between vicious spirits and strong-willed queens that started in the award-winning The Queen of Blood and continued in the powerful The Reluctant Queen comes to a stunning conclusion in The Queen of Sorrow, the final volume of Sarah Beth Durst’s Queens of Renthia trilogy. This is a series that I intend to start and I think I’ve already picked up the first one on audio – so, hopefully, soon. OOh nice! Haven’t read this series though it did always look intriguing! Maybe one day! Hope you enjoy this one once you read it! I love the covers for this series, and again wish I had more time to read EVERYTHING. Hope this finishes off the series in a good way! I have the first sitting on my shelf, waiting for a read. Wonder if I can catch up in time? l keep thinking these books are The Queen of Tearling series. The name and covers are so similar! I haven ‘t even started this series yet and here is the conclusion. I think this is my favorite cover of them all. That is a really beautiful cover!